A research team at Boston’s Beth Israel Deaconess Medical Center has examined differences in the factors that best predict hospital readmissions occurring early in the 30-day cycle (Day 0-7) vs. later (Day 8-30). (1) Their approach is interesting and their article is informative, but it stops short of actually quantifying the extent to which the risk of early vs. late readmission might dovetail or diverge. If one knows the former, to what extent does one know the latter? Might they be redundant? These questions are not adequately answered by the article’s findings showing certain variables to be statistically significant predictors for one outcome as opposed to the other. As leading statistician Andrew Gelman, among many others, has pointed out, the difference between statistically significant and non-significant is often not itself significant. Suppose a predictor’s p-value (significance level) barely exceeds a researcher’s significance threshold for Outcome A, but barely misses it for Outcome B. Such a predictor shows the same essential relationship to both outcomes. In such a case, drawing a line based on significance would create a false dichotomy. Graham et al. analyzed data on 13,000 admissions to a Massachusetts hospital. 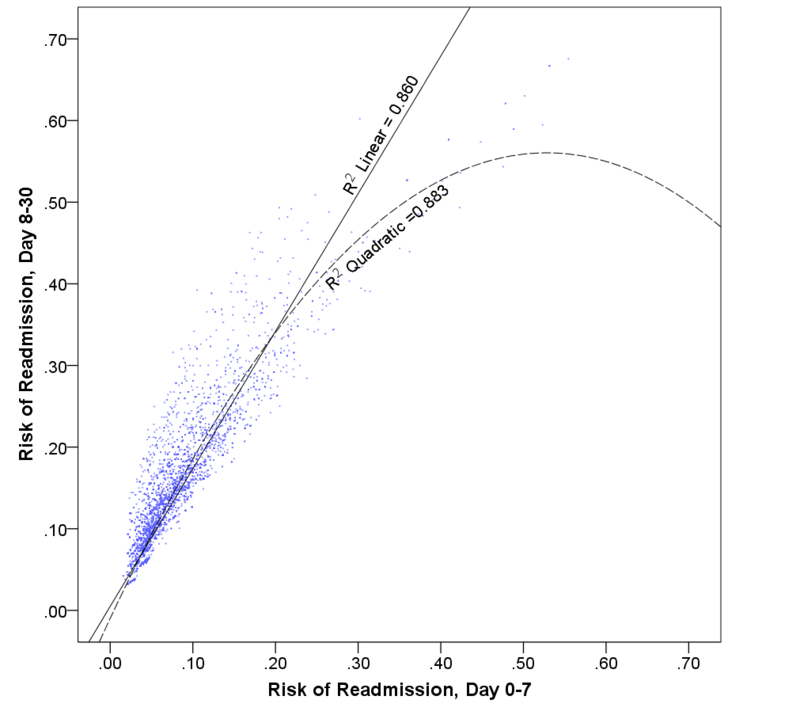 In ReInforced Care, Inc.’s predictive modeling using 30,000 admissions to a mid-Atlantic hospital, we find that risk scores for readmission through Day 7 are indeed largely redundant with risk scores for readmission from Day 8-30. The R-squared between them is 0.88: one can account for 88% of the variance in one version of risk if one knows the other. Thus it is hard to justify treating the two outcomes as being worthy of separate predictive efforts. Despite the way in which some predictors might dance around a researcher’s significance threshold, we have found the factors that predict early and late readmissions to be basically the same. UPDATE Sep. 2, 2016: We obtained very different results when redoing this type of analysis with another hospital, this time for patients from 2013-15 in California. For about 2,000 patients under age 65 and about 3,000 age 65 or over, the R-squared between early- and late-readmission risk was only .49 and .44, respectively. The two types of risk could hardly said to be redundant if one set of scores could explain less than half the variance in the other. In this case we worked with the hospital to investigate in depth the different factors that could best explain early vs. late readmission (separately by age group). UPDATE Nov. 30, 2016: The findings above pertain to results within a single hospital. For a discussion of results between and among hospitals, see our upcoming piece on seven-day readmission as well as the excellent article Rethinking thirty-day hospital readmissions: Shorter intervals might be better indicators of quality of care from Health Affairs. (1) Graham KL, Wilker EH, Howell MD, Davis RB, Marcantonio ER. Differences between early and late readmissions among patients: A cohort study. Ann Intern Med. 2015;162 (11):741-749.